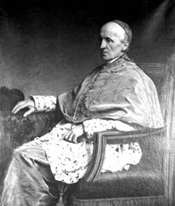 In Today's Catholic World is posting Cardinal Henry Edward Manning's (must-read) book: "The Present Crisis of the Holy See Tested By Prophecy: Four Lectures", 1861. His Excellency - citing the Fathers of the Church and theologians of the greatest repute (such as Aquinas, Bellarmine, etc.) - covers in detail: St. Paul's prophesied revolt and falling away from papal authority (de fide), the suppression of the Holy Sacrifice, the pope's forced exile from Rome, the destruction of neo-pagan Rome, persecution of the greatly beleaguered Church by Antichrist and finally his destruction. or His Vicar upon earth, will share the judgment which is laid up for the Antichrist whom he serves." We have here (in St. Paul's forewarning in II Thess., II:i-iv) a prophecy of four great facts: ﬁrst, of a revolt, which shall precede the second coming of our Lord; secondly, of the manifestation of one who is called “the wicked one;” thirdly, of a hindrance, which restrains his manifestation; and lastly, of the period of power and persecution, of which he will be the author. *Note from TCW: There's nothing "Traditional" about Subverting Catholic Order to found a "Headless church" that tends to war amongst itself 24/7 and purposely fails to mention the word "pope" in its "holy emergency plan" ... **EXCEPT** that it IS the Traditional Blueprint of every Schismatic and Heretical group that has persecuted the Church. Truly, today's Violators (Schismatics) of the (1.) Papal Mandate Law (the Novus Ordo sect's sspx & the sedevacantists) are a bullseye for Pius IX's scathing condemnations in his Quartus Supra, against all fools, who dare oppose the Divine Constitution of the Church. The Prophet Daniel, in the twelfth chapter, says that in the time of the end “many shall be chosen and made white, and shall be tried as fire; and the wicked shall deal wickedly, and none of the wicked shall understand, but the learned shall understand;” that is, many who have known the faith shall abandon it, by apostasy. “Some of the ‘learned shall fall;"* that is, they shall fall from their fidelity to God. And how shall this come to pass? Partly by fear, partly by deception, partly by cowardice; partly because they cannot stand for unpopular truth in the face of popular falsehood; partly because the overruling contemptuous public opinion, as in such a country as this, and in France, so subdues and frightens Catholics, that they dare not avow their principles, and, at last, dare not hold them. The writers of the Church tell us that in the latter days the city of Rome will probably become apostate from the Church and Vicar of Jesus Christ; and that Rome will again be punished, for he will depart from it; and the judgment of God will fall on the place from ‘which he once reigned over the nations of the world. For what is it that makes Rome sacred, but the presence of the Vicar of Jesus Christ? What has it that should be dear in the sight of God, save only the presence of the Vicar of His Son? Let the Church of Christ depart from Rome, and Rome will be no more in the eyes of God than Jerusalem of old. Jerusalem, the Holy City, chosen by God, was cast down and consumed by fire, because it crucified the Lord of Glory; and the city of Rome, which has been the seat of the Vicar of Jesus Christ for eighteen hundred years, if it become apostate, like Jerusalem of old, will suffer a like condemnation. And, therefore, the writers of the Church tell us that the city of Rome has no prerogative except only that the Vicar of Christ is there; and if it become unfaithful, the same judgments which fell on Jerusalem, hallowed though it was by the presence of the Son of God, of the Master, and not the disciple only, shall fall likewise upon Rome. *Malvenda, de Antichristo, lib. iv. cap. 5. *Lessius, de Antichristo, demonst. xii. Bellarm. de Summo Pontif. lib. iv. cap. 4. Such they believe will be the history of Rome: pagan under the emperors, Christian under the Apostles, faithful under the Pontiffs, apostate under the Revolution, and pagan under Antichrist. Only Jerusalem could sin so formally and fall so low; for only Jerusalem has been so chosen, illumined, and consecrated. And as no people were ever so intense in their persecutions of Jesus as the Jews, so I fear will none ever be more relentless against the faith .. than the Romans. Now I have not attempted to point out what shall be the future events except in outline, and I have never ventured to designate who shall be the person who shall accomplish them. Of this I know nothing; but I am enabled with the most perfect certainty, from the Word of God, and from the interpretations of the Church, to point out the great principles which are in conflict on either side. I began by showing you that the Antichrist, and the antichristian movement, has these marks: first, schism from the Church of God; secondly, denial of its Divine and infallible voice; and thirdly, denial of the Incarnation. It is, therefore, the direct and mortal enemy of the One Holy Catholic and Roman Church—the unity from which all schism is made; the sole organ of the Divine voice of the Spirit of God; the shrine and sanctuary of the Incarnation and of the continual sacrifice. And now to make an end. Men have need to look to their principles. They have to make a choice between two things, between faith in a teacher speaking with an infallible voice, governing the unity which now, as in the beginning, knits together the nations of the world, or the spirit of fragmentary "Christianity", which is the source of disorder, and ends in unbelief. Here is the simple choice to which we are all brought; and between them we must make up our minds. The events of every day are carrying men further and further in the career on which they have entered. Every day men are becoming more and more divided. These are times of sifting. Our Divine Lord is standing in the Church: “His fan is in His hand, and He will thoroughly cleanse His floor, and He will gather the grain into His barn, and will burn up the chafe with unquenchable fire”. It is a time of trial, when “some of the learned shall fall," and those only shall be saved who are steadfast to the end. The two great antagonists are gathering their forces for the last conflict;-—-it may not be in our day, it may not be in the time of those who come after us; but one thing is certain, that we are as much put on our trial now as they will be who live in the time when it shall come to pass. For as surely as the Son of God reigns on high, and will reign “until He has put all His enemies under His feet,” so surely every one that lifts a heel or directs a weapon against His faith, His Church, or His Vicar upon earth, will share the judgment which is laid up for the Antichrist whom he serves. Today is the Holy Feast of Ss. Peter and Paul. Let us redouble our prayers for St. Peter's True Successor, Gregory XVIII, now in exile. God Bless and protect Pope Gregory XVIII in exile. "These are times of sifting. ... It is a time of trial, 'when some of the learned shall fall,' and those only shall be saved who are steadfast to the end." I am convinced that I need to tell my family. "consecrations" finished the deed ... basically killing the opposition (placing multiple souls under anathema/censure). Yet, still our Faith is Divine! Thank God for Fr. Khoat!